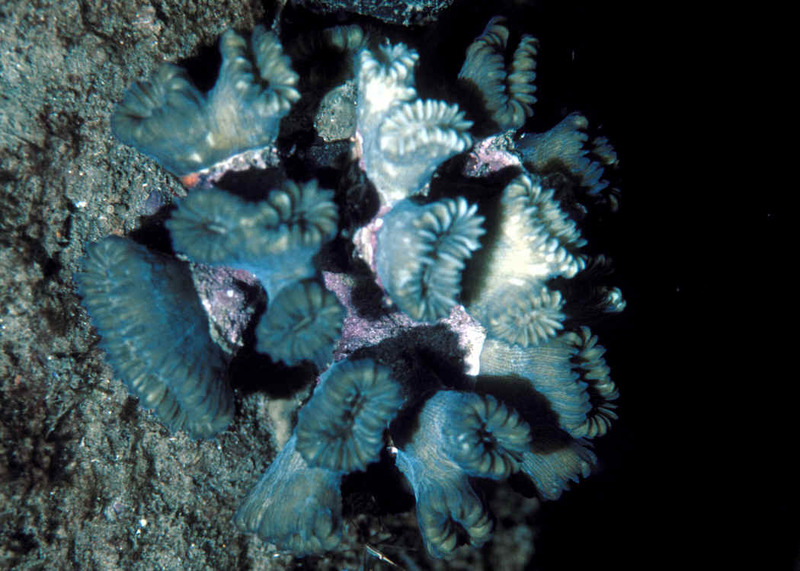 Family Meandrinidae: Easily mistaken for Faviids, the widely separated species of Meandrinid corals can be discerned by their solid skeletal structure. 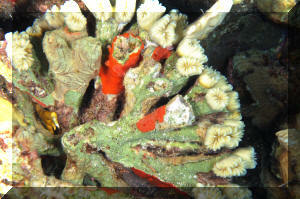 With polyps closed their corallites septa are clearly seen as prominent, exsert (sticking out), of equal size and spacing. Three genera (Eusmilia, Gyrosmilia and Montigyra) were moved by Veron (2000) to here from the Caryophylliidae. Four genera in the tropical West Atlantic, three in the eastern Indian Ocean and Red Sea. Genus Dendrogyra: Veron now places this genus in the Family Astrocoeniidae. 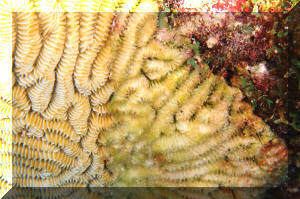 Dendrogyra cylindrus, Pillar Coral. Upright, generally arising from sandy areas. 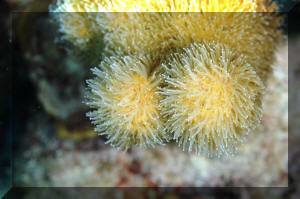 Polyps typically open, feeding during the day. Cancun, Mexico image. Dichocoenia stokesii Mile Edwards & Haime 1848, Elliptical Star Coral. Flattened plates or boulder-shaped. elongated corallites spaced evenly. Bahamas photos of a plate-like colony, close-up of a typical shallow water and deeper, more-shaded colony. Bahamas pix. Genus Eusmilia Milne Edwards & Haime 1848, one species. Eusmilia fastigiata (Pallas 1766) . 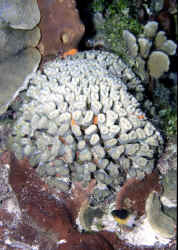 Typically dome-shaped, phaceloid colonies with well-spaced tubular corallites. Found sparsely throughout the tropical West Atlantic. Extends tentacles at night. 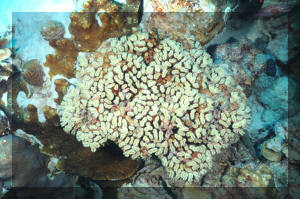 Images taken in Bahamas of small and large brown colonies at right, and Tobago and at night, feeding in Bonaire below. Genus Meandrina Lamarck 1801. Veron now places this genus in the Family Astrocoeniidae. Meandrina meandrites (Linnaeus 1758), Maze, Butter Print, Tan Brain Coral. Occurs as flattened and hemispherical colonies. Thin ridge at top of septa where plates come together; shallow valleys that bifurcate at their ends. Right, at night in Bonaire. Bahamas photos below.